We don’t need to exaggerate by even word the beauty that adorns Kerala! 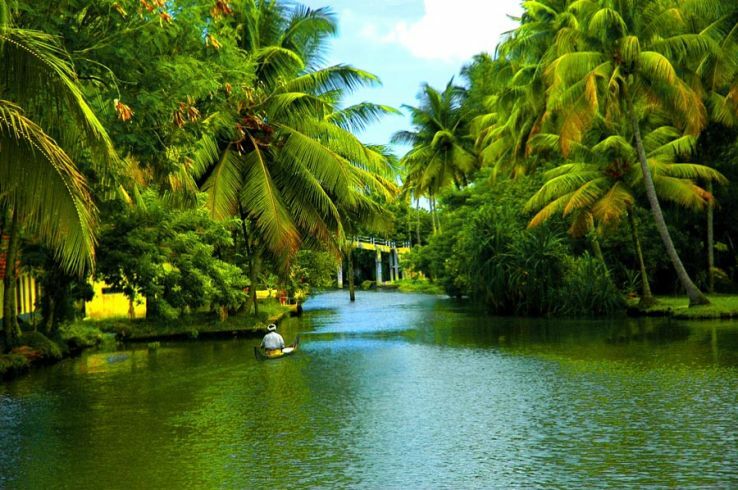 Luscious greenery, scenic views and the backwaters- Yes, it is real and it exists in Kerala! The country side offers a view to large fields growing species or paddy, humongous coconut trees which produce the most authentic oil and fruit or even the pristine beaches with clear waters that will melt your heart! Kerala is home to the most luscious and gorgeous greenery in India. My experience of staying in the houseboats in the backwaters offered a monumental change from our everyday life! You would roam around the streets in Kochi to explore the nitty gritties of a South Indian town or you could just sit back and relax at the Kovalam beach to find yourself in some tropic paradise. What drives me to a place as a traveller is the food and cuisine.. Kerala being the home of spices and sea food offers a taste that you wouldn’t find elsewhere. If you think the place is just about typical south Indian food, you are wrong! On the other hand if you love sea food, Kerala is the place for you. My all-time favourites include the Appams- the pancakes made from rice, enjoyed with mutton curry or the famous Sambhar! If you are meat lover, then why not explore the amazing Prawn Moilee and Beef Fry? The lobster dishes too are authentic and absolutely heavenly in taste-served in a curry with a flavour of coconut and Kokum! If you would like to experience Kerala wildlife, then Periyar is the place for you. The forest region offers stunning views and is home to various famous animal and plant species. Kerala also remains famous for its tea estates. These tea gardens offer a different view from the ones you find in North India. Do explore these places in Munnar and get a taste of the freshly brewed tea at a tea garden! I haven’t ever gone back home empty handed whenever I have visited Munnar. The tea is absolutely to die for and no brand can replace the taste! Most of us have seen Kerala- if not in reality, then certainly in movies! Kerala’s natural beauty doesn’t need any fancy words or descriptions. This is the reason that this southernmost state is one of the most expensive tourist destinations in the country.